The Painted Lady is one of our migrant species of butterfly. Each year, it travels from North African desert fringes, the Middle East and central Asia. What an amazing feat for such a tiny insect in order to feed and breed on their favourite plant – a thistle. 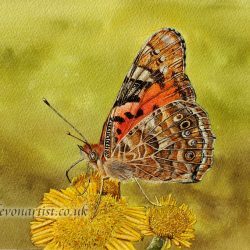 My painting depicts them on Common Fleabane another good plant for attracting butterflies. 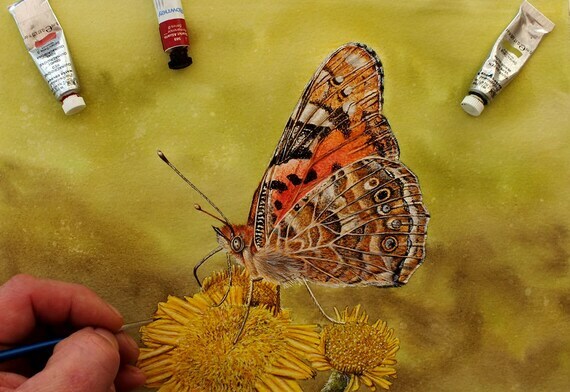 You are looking at an original watercolour painting of a Painted Lady Butterfly. This has to be one of the most beautiful butterflies with so many colours, tones and shades within the wings, a joy for me to paint. The size of the painting is approx. : 210mm x 279mm (8.27″ x 11.69″). 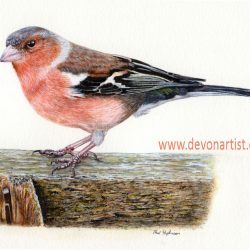 The butterfly has been painted on an excellent quality watercolour paper using the finest of brushes for the tiny detail produced.